All individuals have turbinate dysfunction at some point in their lives. Symptoms of turbinate dysfunction range from total nasal obstruction to mild congestion and/or rhinorrhea. Causes of turbinate dysfunction include upper respiratory infection (URI), allergic rhinitis, and vasomotor rhinitis. Drugs or hormones may also induce turbinate dysfunction. This article discusses the common and less common causes of this problem and its focused management. See the images below. Mucosal hypertrophy of the right inferior turbinate with total airway obstruction. Normal-sized right inferior turbinate with a moderate inferior septal deflection. Nasal congestion is the most common symptom associated with turbinate dysfunction. Symptoms may be mild, or the congestion may be so great that the only relief is to overuse (abuse) topical decongestants such as oxymetazoline or phenylephrine. Many patients have tried over-the-counter (OTC) oral decongestants with limited success. The key to successful management is to identify the underlying cause of the turbinate hypertrophy and either correct or treat the cause. Infectious and inflammatory causes are the most common etiologies. Turbinate dysfunction is universal. Every person experiences some degree of turbinate dysfunction at some point in his/her lifetime. Persistent dysfunction is not uncommon and involves approximately 50% of the population. Allergic rhinitis is the most common cause of turbinate dysfunction. Allergic rhinitis is due to environmental allergens that come in contact with the nasal membranes, causing an inflammatory reaction and resultant congestion and increased drainage. This category is so large that any nonallergic cause of turbinate dysfunction is known as vasomotor rhinitis. Vasomotor is a term that indicates the neurovascular control of the nasal membranes. Causes of vasomotor rhinitis include, but are not limited to, the use of cardiovascular and antihypertensive drugs, female hormones, changes in temperature, and rhinitis of disuse. Condensation rhinitis is well known to snow skiers and is due to the reaction of the nasal membranes to the colder outside environment. An equivalent example is that of taking a cold beverage can outside on a hot day and finding condensation developing on the outside of the can. Rhinitis of disuse occurs in patients who no longer use their noses for airflow (eg, patients who have undergone laryngectomy) or those who abuse topical nasal decongestants (rhinitis medicamentosum). In the first case, the underlying pathophysiology is rebound inflammation due to a lack of feedback from the normal nasal airflow. In the second case, a rebound vasodilation of the turbinates occurs as a response to the topical sympathomimetics. Similar to the rest of the upper respiratory tract (URT), the membranes of the turbinates are composed of ciliated, pseudostratified, glandular, columnar epithelium. The cilia beat in unison to propel the mucus from the nasal cavity toward the nasopharynx, where the mucus can then be swallowed. Mucociliary transport relies on mucus production and ciliary function. Normally, the nose and paranasal sinuses produce approximately 1 quart of mucus in a 24-hour period. When inflamed, that amount can more than double. Mucus contains immunoglobulin A (IgA), immunoglobulin E (IgE), and muramidase. Both the blood supply and the autonomic nervous system control the secretions and level of congestion of the turbinates. The autonomic nervous system provides the general innervation to the nose, with the parasympathetic nerves supplying the resting tone and controlling secretions. The nerve supply originates from the facial nerve at the inferior salivatory nucleus and follows along the distribution of the facial nerve through the sphenopalatine ganglion. The blood supply to the nose comes from branches of both the internal and external carotid artery systems. The terminal branches of the internal maxillary artery supply most of the mucosal surfaces of the nasal cavity. Patients with turbinate dysfunction report nasal congestion, postnasal drainage, and occasionally, midfacial headaches or facial pain and discomfort. Anterior rhinorrhea is less common but may be noted. These symptoms can occur irrespective of etiology. If marked swelling of the turbinates results in contact with the septum or lateral nasal wall, then nasal headaches may occur. Patients report pressure and headaches in the central forehead and medial canthal regions. Symptoms of congestion in some cases may be so bad that the patient develops an addiction to OTC nasal sprays containing either oxymetazoline or phenylephrine. This condition is known as rhinitis medicamentosum. See the image below. Mucosal hypertrophy of the left inferior turbinate with impingement of the septum and narrowed nasal airway. 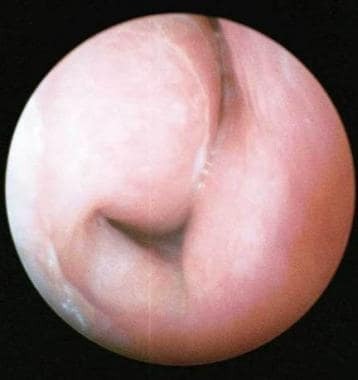 Intermittent blockage of 1 nasal passage followed by switching of the congestion to the other nasal passage is a common report and is known as the nasal cycle. Patients may describe positional congestion, such as when lying on 1 side while sleeping. The nose is thought to shut down 1 nasal passage every 2-4 hours in order to prevent desiccation and irritation from inhaled air. The extent of this shutdown can range from complete obstruction to a slight degree of congestion that is hardly noticed. Treatment is not required unless the symptoms are exaggerated because this shutdown is part of normal nasal physiology. 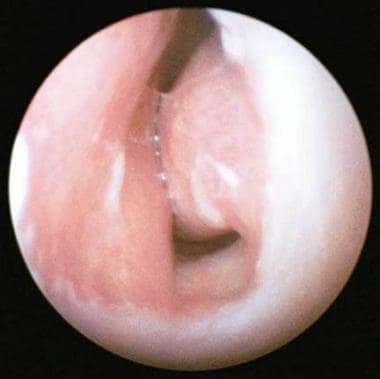 If a middle turbinate is paradoxically bent (curved or angled laterally) or if it contains a sinus (concha bullosa), the ostiomeatal complex may be compromised more easily and lead to acute or recurrent acute rhinosinusitis. This anatomic deformity may require surgical correction after failure of medical management. Concha bullosa occurs in approximately 30% of the population and is usually an incidental finding on imaging modalities. Indications for the management of turbinate dysfunction include a clinical history of bothersome nasal congestion and postnasal drainage with or without paranasal sinus disease or a significant septal deformity. Because the ability to breathe out of one's nose is a quality of life issue, many patients take it for granted, and when the nasal airway is diminished, people often tolerate it. Many treatments are available for this disorder, and isolating the etiology is hallmark for successful therapy. Identifying whether symptoms are due to allergies or other causes is the first step. A careful history and allergy testing, if indicated, are most useful. Offending medications may be substituted or at least identified. If the patient continues to have symptomatic turbinate dysfunction, then initiate medical therapy. Surgical therapy is reserved for those patients that do not respond to appropriate medical therapy and clinically remain symptomatic. For more information, please see the Medscape Reference articles Nasal Anatomy; Nasal Cavity Anatomy, Physiology, and Anomalies on CT Scan; and CT Scan of the Paranasal Sinuses. The inferior turbinate bone arises on the inferior portion of the lateral nasal walls. The bone itself is penetrated heavily by vascular channels, which supply the overlying respiratory epithelium. The lacrimal duct exits into the nose below the inferior-anterior portion of this structure. Surgical therapy is reserved for symptomatic patients with persistent hypertrophy of the turbinates who are not responding to medical management or in whom medical management is contraindicated. See Surgical therapy. Clark DW, Del Signore AG, Raithatha R, Senior BA. Nasal airway obstruction: prevalence and anatomic contributors. Ear Nose Throat J. 2018 Jun. 97 (6):173-6. [Medline]. Salzano FA, Mora R, Penco S, Traverso D, Gaggero G, Salzano G, et al. Nasal tactile sensitivity in allergic rhinitis. Acta Otolaryngol. 2011 Jun. 131(6):640-4. [Medline]. Wolstenholme CR, Philpott CM, Oloto EJ, Murty GE. Does the use of the combined oral contraceptive pill cause changes in the nasal physiology in young women?. Am J Rhinol. 2006 Mar-Apr. 20(2):238-40. [Medline]. Sharhan SSA, Lee EJ, Hwang CS, et al. Radiological comparison of inferior turbinate hypertrophy between allergic and non-allergic rhinitis: does allergy really augment turbinate hypertrophy?. Eur Arch Otorhinolaryngol. 2018 Apr. 275 (4):923-9. [Medline]. Freeman SC, Kahwaji CI. Physiology, Nasal. StatPearls. 2018 Jan. [Medline]. [Full Text]. Ozcan C, Vayisoglu Y, Dogu O, Görür K. The effect of intranasal injection of botulinum toxin A on the symptoms of vasomotor rhinitis. Am J Otolaryngol. 2006 Sep-Oct. 27(5):314-8. [Medline]. Singh DP, Forte AJ, Apostolides JG, Zahiri HR, Stromberg J, Alonso N, et al. Transoral submucosal resection of the inferior turbinate: a novel approach to functional rhinoplasty. Ann Plast Surg. 2012 Jan. 68(1):46-8. [Medline]. Garzaro M, Pezzoli M, Landolfo V, Defilippi S, Giordano C, Pecorari G. Radiofrequency inferior turbinate reduction: long-term olfactory and functional outcomes. Otolaryngol Head Neck Surg. 2012 Jan. 146(1):146-50. [Medline]. Barham HP, Thornton MA, Knisely A, Marcells GN, Harvey RJ, Sacks R. Long-term outcomes in medial flap inferior turbinoplasty are superior to submucosal electrocautery and submucosal powered turbinate reduction. Int Forum Allergy Rhinol. 2016 Feb. 6 (2):143-7. [Medline]. Chen XB, Leong SC, Lee HP, Chong VF, Wang DY. Aerodynamic effects of inferior turbinate surgery on nasal airflow--a computational fluid dynamics model. Rhinology. 2010 Dec. 48(4):394-400. [Medline]. Nilsen AH, Helvik AS, Thorstensen WM, Bugten V. A comparison of symptoms and quality of life before and after nasal septoplasty and radiofrequency therapy of the inferior turbinate. BMC Ear Nose Throat Disord. 2018. 18:2. [Medline]. [Full Text]. Bony hypertrophy of the right inferior turbinate following topical vasoconstriction. A stab incision is made at the anterior head of the inferior turbinate. Blunt dissection beneath the mucoperiosteum elevates tissue for subsequent microdebridement. The microdebrider is turned in all directions, but mucosa is entirely preserved. Video courtesy of Vijay R Ramakrishnan, MD. Medscape Drugs and Diseases thanks Vijay R Ramakrishnan, MD, Assistant Professor, Department of Otolaryngology, University of Colorado School of Medicine, for assistance with the video contribution to this article.